You’re entered to win oysters for a year every time you order a dozen oysters in the month of March. Each week we’ll feature oysters from a different region including Virginia / Chesapeake Bay, Rhode Island / Delaware / New York, New Brunswick / Maine / Prince Edward Island / Nova Scotia, British Columbia & Washington / California. $3 cans from The Post Brewing Co., Tito’s bloody & Milagro mignonette oyster shooters, Oyster Bay wines and a Car Bomb oyster shooter – think you can handle it? Save the date for the 6th annual High West Oyster Fest. It’s Back and it’s sure to be better! Our longtime partners and friends, Rappahannock River Oysters Co. raises the Emersum boutique oyster just for Jax. Each day our Colorado Jax locations will donate 10¢ per Emersum Oyster shucked throughout the month of March to charities from within their communities. Our Kansas City Jax Fish House location will be donating all proceeds from their Oyster Eating Competition to Leukemia & Lymphoma Society. 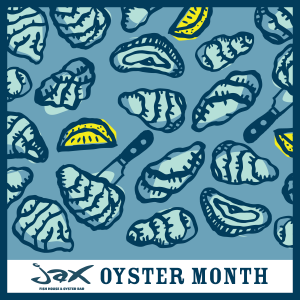 In addition, each day Jax KC will donate 10¢ per Emersum Oyster shucked throughout the month of March to Leukemia & Lymphoma Society.